This is the first of two photographs of Fountain Villas and Derwent Parade, taken in the 1870s; the next image was taken just slightly later, as there are minor differences. The two pictures must be amongst the earliest ones taken of the village; prior to that the images had been engravings. We can arrive at an approximate date because the Derwent Terrace Wesleyan Chapel, which is further along the Parade, was built in 1867. The Jubilee Bridge, constructed in 1887, is in neither photograph. So these views of Matlock Bath were taken somewhere between the two dates - and the second picture is easier to date. The stone wall on the riverbank side of the road bounds what was the first promenade, mentioned by Benjamin Bryan as being open in 1874. In 1873 a plan was prepared by Mr. Stokes of Darley and the design was to be carried out by Mr. Smith, the Darley nurseryman. It was to be on land opposite Derwent Parade, running parallel with the river Derwent for about 300 yards, where "visitors to this charming locality may saunter and enjoy themselves without being subjected to the now inevitable 'sixpences' or 'shilling'". Money was raised by public subscription and the project was constructed independently of the Local Board, but there must have been some difficulties as in 1875 it was not open. By 1882 the Local Board were planning further work. The wall was replaced by a much lower one when the Jubilee Bridge was built and the Promenade developed and extended in 1887. The very low stone boundary wall, which was initially topped by low metal railings, is shown clearly in other images on this web site. It is interesting to see the upturned rowing boats; they are just about where the "Boats for Hire" sign is on the following picture. Original postcard in the Frith Series in the collection of and provided by and © Ken Smith. Image scanned for this website and information researched by and © Ann Andrews. "Derbyshire Times", 12 July 1873. "Derbyshire Times", 21 July 1875. "... this piece of tastefully laid out ground would be a boon to regular visitors, and why it is not opened there really is no shadow of good reason to show". "Derbyshire Times", 11 February 1882. Letter from Mr. Newbold, who had prepared plans for the Board. "The Derby Mercury", Wednesday, June 1, 1887. 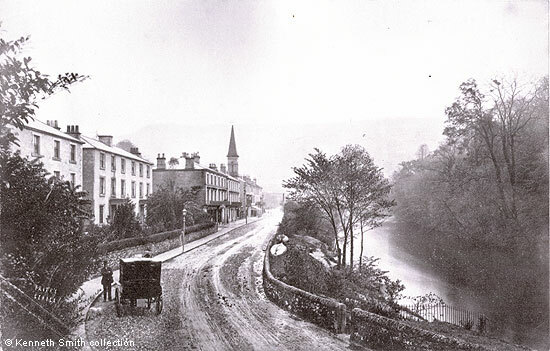 "The grounds are being rapidly laid out on the north side of the river Derwent at Matlock Bath ... "
 See, for example: North Parade, late 1905 | Matlock Bath : The Parade, 1902-05 | North Parade, Matlock Bath, 1908.